This year I decided to try shooting some coyotes in the heart/lung as a dispatch technique. The best method I have found for determining exactly where these organs are, is to open the critter up. Here is the result of a necropsiesd coyote. 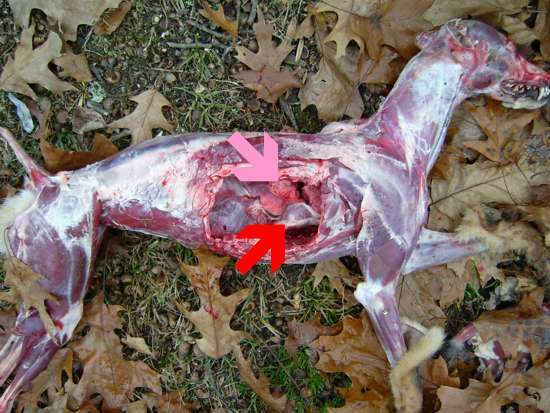 The pink arrow points to the lungs and the red arrow points to the heart. Thanks Hal, I would have figured they would have been a little further forward. How is dispatching them with a heart lung shot working out? They always say a picture is worth a 1000 words. That picture is an great example. It could probably save a lot of suffering on the animal if people will actualy take notice of it, and use it to know where the vitals are. What's the purpose of the body shot? I know about rabies "fumes" and perhaps skull sales but besides that? Since the "target" is not visible the body shot actually seems tougher to make. I've taken body shots on wolves to calm them down in a hurry IF the head shot was too difficult. A head shot followed. That is a very informative picture. I too would have thought that the vitals would have been further forward. Before seeing that picture, I would have aimed for just behind the front shoulder. Now I know, should the need arise (and hopefully it will), to place the shot just a little further back . Musher- Some prefer a heart/lung shot because it allows the animal to bleed-out internaly whereas a headshot spills quite abit of blood while skinning. Hal, I too would appriciate hearing your thoughts, once you give it a try. I have considered it (for the very reason I mentioned above), but currently choose the confidence I have in the quickness of one to the head. leaving the animal hang head down for a while prior to skinning solves much of the blood problem. A used rubber glove on the head solves the rest (I learned that trick from someone that posted it here. ). With a body shot you get blood also. However the blood is on the valuable fur, including the paler belly, as opposed to the head. So far, I can tell you that a shot to the heart kills the animal almost as quickly as a brain shot. That’s what I’m trying to accomplish. But if my aim is a little bit off a shot to the lungs is pretty quick too. For starters, shooting a coyote this way leaves much less blood at the set. As anyone who has tried it can attest, shooting a coyote in the head results in quite a pool of blood by the time it is done. I’ve never been worried about blood on the fur. A little soap and water will fix that, and most of the time, the coyotes I catch are so dirty they have to be washed any way. The advantage comes in skinning the animal. With a headshot coyote, the blood just keeps flowing out of the coyote all the time you are skinning it. (You wouldn’t think it would, as much as runs out at the set, but it does.) When I get to the head of the coyote often the blood runs out so bad that it is hard to see to make the finishing cuts on the head, and by the time I’m done blood is running down the outside of the pelt all the way to the floor. The heart/lung shot leaves most of the blood in the chest cavity. Very little leaks out at the set. Some may leak out when you hang the animal up to skin, but it will stop eventually. I still end up washing the pelts, but this heart/lung shot results in much less bloody mess than a head shot does. Let us know what type ammo you're using, not sure, but I'd guess a standard high-velocity, hollow-pt, .22 LR would only make the entry wound? Rifle or handgun? It would make a difference if you hit a rib on the front side. With only one wound, looks like you could lay the animal with the hole on top, a lot of the blood inside would clot after 2 or 3 hours, and nnot be a concern. The best round for the heart lung dispatch is the CCI Quick Shock. The bullet in this round is acutaly fused of three pieces. On a coyote, the the three pieces lie just under the skin on the opposite side of the entrance and form a "group " of about three inches in diameter. I shoot these out of a snub nose and therefore have no experience on exits patterns from a long gun.